What better way to kick off the 2013 Grammy Awards weekend than by attending the Red Carpet Events LA Grammy Gift Lounge. With dozens of celebrities in attendance, we made sure to catch up with all of them to give you the scoop about what is on all of their minds leading up to the Grammys this Sunday! 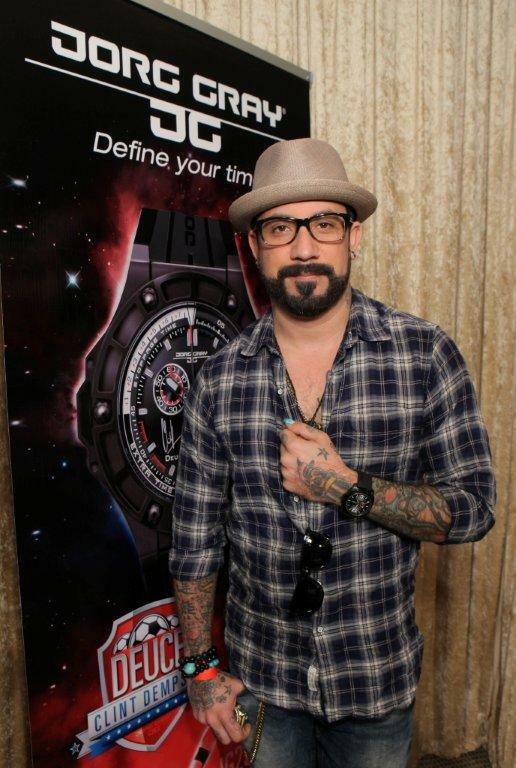 New dad AJ McLean of the Backstreet Boys was also in attendance and just couldn’t stop gushing to us about his newborn baby girl, Ava! When asked if he would be attending the Grammys this weekend AJ said, “I’m hoping to… its hard being a new dad and trying to make things work. We don’t have a nanny; we are doing everything on our own. We can’t bring her to the Grammys, although she does have a very nice red dress she could wear.” McLean, who has always been known to push fashion boundaries, says he hopes that his daughter develops her own sense of style and doesn’t necessarily follow trends. He did say however, “if she ends up growing into my wife’s Louboutins, she will end up having a bunch of vintage Louboutins by the time she hits sixteen.” Lucky girl! With a new baby, a gorgeous wife, a jewelry line, and a fashion line coming out, it’s shaping up to be a busy 2013 for this Backstreet boy! Other celebrities in attendance included: John Paul White, Ryan Beatty, Tia Carrere, Carolyn Hennesy, Lou Ferrigno (Hulk) and many more! Ryan Beatty and Rogerz Zamudio. 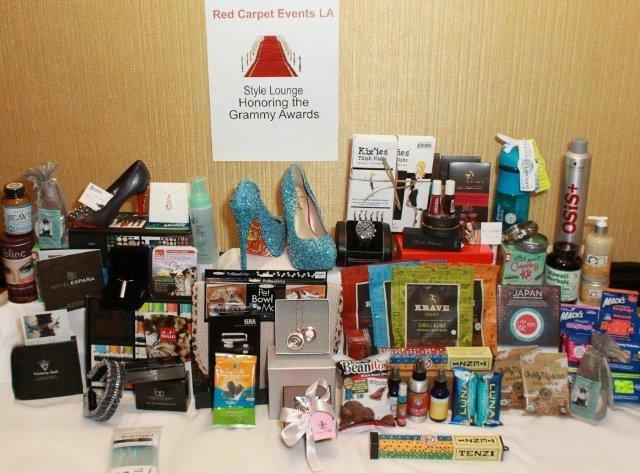 Red Carpet Events LA presented a glamorous gifting suite for the nominees and Presenters in honor to the Grammy Awards 2013! This luxurious gala Swag Gifting lounge showcased an array of luxurious products and services such as one of the kind trips “Hotel España, Royal Belize and Viceroy Bali”, spa services, custom shoes, skincare, handbags, travel goods, custom jewelry, gourmet food, kids’ items! The Pavilion Plaza Ball Room at the Hyatt Regency Century Plaza was packed with Red Carpet Events LA Sponsors! It is nice to see a great cause when one go to a Swag Gifting Suite, Red Carpet Events LA benefited Charity: African Millennium Foundation (AMF) seeks to target poverty, hunger and disease at its very root by providing African women and children with the necessary tools for achieving self-sufficiency. And, Society for the Prevention of Cruelty to Animals (SPCALA ): The organization believes that animals, as living creatures, have value beyond economic measurement, and are entitled to legal, moral and ethical consideration and protection. Red Carpet Events LA gave to the celebrities and Media a Swag Bag full of gifts, but then again, It gave back to the one that needs it the most through their support to the AMF and SPCALA. Red Carpet Events LA added a regal touch to its “Luxury Gifting Suite!” The Celebrities were pamper with many products and new Jewelry collections from its sponsors. The sponsors showcased and give away a variety of their Jewelry that capture the essence and individuality of every guest like nothing else and the spirit of the Grammys. It was truly one of the kind experience for Celebrities, Media as well for the Sponsors! Every Sponsor had one of the kind item, for instance: Jorg Gray Watches the watch worn by Barack Obama is a real standout presidential choice. Quoin: They believe that, “If you’re feeling inspired, create your own favorite jewelry.” Tasha R: Featured fine jewelry in 14K, 18K, and .. Shuzi Qi: hade items for you and four animal amazing utilizes a proprietary Chip from United States, which is programmed to resonate with cells’ natural frequencies. Weberline Couture Gloves, Scarves and Hair Candy (hair accessories). Chocolate Creations by Chara provided their sweet treats chocolate in the form of a shoes that are the ultimate gift for the shoe-lover. Taylor Says an unprecedented line of high heel shoes featuring custom designed leather printed soles. Ultimate Body Applicator: present powerful, botanically-based formula to deliver maximum tightening, toning, and firming results were applied to the skin. SeaVeg (FarmaSea) created what is now considered the most powerful blend of edible sea plants on Earth. Known for having the latest in skin and beauty products, this year’s lounge will feature natural and organic makeup and skin care lines designed to provide access to sustainable, healthy and comfortable products by Couleur Caramel, Dermaesthetics Beverly Hill- Professional Skin Care was created to provide the best and highest quality skin care products. Special thanks to Roger Zamudio of Red Carpet Events LA for a taste of the Grammy Awards Fabulous experience.